This weekend, the Circus Train rolled back into town after over a quarter of a century on tour. This train was my first birthday present from my parents. The pieces traveled around the country as my family moved. I can remember the train tooling across our arid Texas driveway and stalling on the thick lime green shag of our Indiana home. As I got older, the train rolled on to my younger cousin. When we visited, he and I would play with it on their brick hearth or shady back patio. After it was cast aside for other toys, my wise aunt kept it (along with an airport, a parking garage, a farm, and a house) for the quiet years until an older cousin's children brought fanfare back to the center ring. At least 5 children and two decades later, the train (and airport) arrived at my house. Even considering the monkey's decision to become an ape (he apparently opted for tail removal surgery), it's in amazingly good condition for being 30+ years old. Ranger, Jim, and I are really enjoying these great vintage toys. It's exhilarating to simultaneously connect to my own childhood memories while playing with Ranger. Thanks, Aunt Carol, for years of storage and sharing the toys with us now! Did you or your family save any childhood toys for intergenerational reuse? Are there any toys you plan to save for the next generation? When a student leaves my mom's fifth grade classroom, they take with them a lot of experience in writing thank you notes. Though I'd like to say her fine influence has made me an exemplary written correspondent, that would be a disturbingly egregious lie. Thank you notes have been particularly problematic for me. I spent many years trying to write a perfect note to express appreciation for truly generous acts. A good friend (who also happens to be a fine writer) counseled me that a perfect thank you note is any appreciative one written in a timely manner. Since that conversation, I've been a lot better about offering thanks. Jim and I wanted a way for Ranger to engage in pro-correspondence environment even while pre-literate. Friends and family have been wonderful about sending him mail- especially post cards, so he knows firsthand the pleasure of receiving mail. For Father's Day, he let us trace his hand onto a homemade card for my dad. A few weeks later Jim was sending a birthday card to our favorite primatologist and Ranger kept circling him- asking insistently for paper and crayons. Jim gave him coloring sheets and crayons, but he kept asking for more. Finally he brought a coloring sheet to me, handed me a crayon, and placed his hand at the center of the paper to be traced. "Jim, I think he wants to sign the card." So Jim traced Ranger's hand inside the card. Ranger was proud and satisfied. He handed the crayons and paper back to me and went in the other room to play. With Ranger's handprint contribution, he's an active part of our all family thank you notes and written greetings. And honestly, it gives me even more motivation to write. This morning he and I caught up on our correspondence with 6 thank you notes. Even if this doesn't give him a lifelong interest in thank you notes, maybe he'll simply become a fan of the Peter Lorre horror classic Beast With Five Fingers. I also try to keep a pack of blank cards in the car for quick access and unexpected delays. These great instructions (and thougtful post on thank you writing) at Soule Mama show how to make a lovely and practical portable correspondence kit. When travel and food writer, Debbie Dubrow, found unsafe, dirty, broken, and expired car seats at the San Diego airport Advantage Rent a Car, she worked to change the system. And it looked like she, through media exposure and direct communications with Advantage, had made great changes. Less than a year later, Barbara takes her 6 months old into the LAX Advantage and finds that the all the policy changes Advantage made in response to Debbie have resulted in are the plastic bagging of the same unclean and defunct seats. Read all about it on Debbie's Delicious Baby blog and avoid Advantage unless you're toting your own seat. Thanks, Zrecs for the update- and the great post on Advantage's corporate policy. Ranger and I got up early this morning to visit my Dad in pre-op before orthopedic surgery. Yellow medical case in hand, Ranger garnered a lot of attention from surgical staff in a lab green set of scrubs. Dad couldn't help but laugh to see toddler Ranger all decked out for surgery. 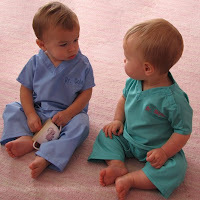 Ranger's scrubs are My First Scrubs from Princess Linens ($28). We see them as having quite a bit of utility as dress clothes and a Halloween costume. The positive attention from medical staff seems perfect for keeping older siblings in focus when a new baby is born. The scrub sizes seem to run a little smaller than average. Ranger is currently on the upper end of 2T in most clothing, so we ordered a 3T. The 3T turned out to be a close fit now. I think a 4T would have been the best choice to allow for growth and easy playtime use. Sizes range from infant to children's 8. Princess Linens, who also makes the Doodlebugz Crayola holders, is currently offering a 15% discount if you use the coupon code babytoolkit. This, according to Jim, is our portable time machine: I think he's watched Primer too many times. I refer to it as the egg: Last fall, Whirlpool sent us their Fabric Freshener (MSRP $199) for a real life trial. As clean corduroys and a sweater tend to define our family's standard of formality, it took some time for us give it a substantive test. The idea behind the Fabric Freshener is pretty basic. 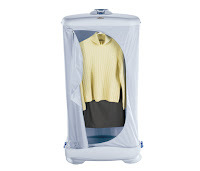 Insert clothing which is typically dry-cleaned, fill with appropriate level of distilled water, and close. The water is transformed to steam and circulated throughout the bag. Then interior sensors deploy the fans and gently dry items. While this can't entirely replace dry-cleaning, it does extend the time between visits to the dry cleaners by removing wrinkles and odors. It's also chemical-free (which I really like). A smoker friend gave me a wool jacket. I was pretty nervous about using wool because I know it shrinks and felts in the wrong conditions, but after a full cycle the jacket emerged exactly the same size and texture. The smell of smoke was gone and the jacket's colors looked more vibrant. I've used it to successfully dry woven rugs and take the chlorine smell out of swimsuits. Someone with Martha Stewart style creativity could probably use it for everything from drapery freshening to bagel making (but we lack such domestic ingenuity). The machine seems to have promise for families who dry clean often and want to reduce their chemical use/exposure, but in our typically permanent press household it's more of a conversation piece or home video prop. UPDATE, 2-17-09: We no longer recommend the new version of the FUNtainer straw bottle (shown here as Hello Kitty). Please read our detailed concerns about the NEW version straw bottle. A little over a year ago, we compared our beloved FUNtainer straw cups with Thermos' Foogo straw cups. While the FUNtainer and Foogo look much the same and both function well in daily use, their inner assemblies were really different. In the spring a new generation of FUNtainers started appearing on the shelves. 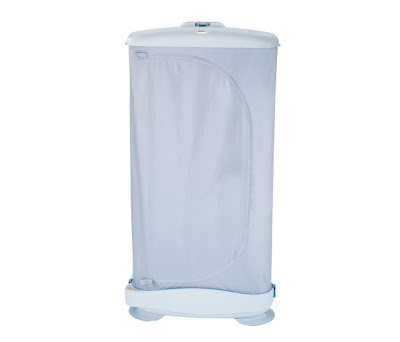 These new FUNtainers can be easily identified by their oval push-buttons. We picked up a new Hello Kitty model at Target for around $15. All the Target offerings were licensed characters (Dark Knight Batman, Pirates of the Caribbean, Speed Racer, and Barbie). We're not that into licensed characters here, so we chose one we could give to our niece who needs (straw cups for school) after testing. It turns out that these new FUNtainers innards are more like the Foogo on the inside. The old short straw on top of the lid has been replaced by a through-the-lid straw assembly that I absolutely love. The two new silicone pieces are so much harder to lose in the dishwasher. There's also no chance of top straw removal by a very persistent young infant or toddler (unless they manage to take off the entire screw-on lid which would be quite a feat). The new version has a silicone disk with an integrated straw that pushes up through the screw-on lid. The lower straw attaches to the silicone disk rather than the plastic screw on lid. Left images show the straw assemblies on the old (blue) FUNtainer versus the new (pink) one. Right image shows the assembled FUNtainers from below. One of the best aspects of the new assembly is not having to clean the very small opening where the straws attach to the screw-on lid. I really like this new FUNtainer design, but the plastic seems to have changed. We didn't have any problems with breakage on our old FUNtainer lids at all despite over a year's worth of regular (rough) toddler use, but the Hello Kitty lid was already cracked (though I didn't notice) when I took these comparison pictures. After pre-washing the Hello Kitty FUNtainer, I filled it and heard a sharp snap when screwing on the lid. The new lid seemed to close normally even though hinges was visibly cracked. Unfortunately any sideways pressure on the lid now allows it to pop open. So, I called Thermos (1-800-831-9242) and they're sending us a replacement lid. Others have reported similar problems with cracking FUNtainer lids in 2008, so I'm not sure the new screw-top lids are as strong as their predecessors. With Thermos' prompt customer service response, I suspect that they will soon remedy this if it is a manufacturing defect or shipping introduced problem. If you want to avoid the potential lid hassle though, the Foogo appears to have no changes in the plastic screw-top lid. Like the first generation Funtainers, the new versions come with a bagged replacement upper and lower straw assembly tucked inside. Additional replacement straws can also be purchased for a nominal fee through Thermos' toll free number. The only change I can find in the Foogo since its introduction in 2007 is cosmetic. As far as I can see, the current Foogo (pink) is identical to the original version (blue) except the plastic disk inside the upper straw assembly is now clear rather than the color of the screw-on lid. This makes the disk slightly harder to find in soap suds. The Foogo's lid remains a 4 part straw assembly (upper straw, inner disk, lower straw, & screw top) opposed to the 3 part assembly of the FUNtainer (upper/lower straws, & screw top). For dishwashing simplicity I prefer the new FUNtainer straw cups. The lower straws of the FUNtainers and the Foogo seem to be identical- which simplifies assembly when you own a variety. It doesn't look like many of the new style FUNtainer straw cups are available online at this point. Amazon presently shows no lids with oval buttons nor does Thermos' own site. Friends have reported seeing the new styles in big box retailers like Target, but their online stores aren't showing any offerings. Keep watching though, I suspect the next generation will soon be widely available online as old stock sells out. All in all, when the lid issues get straightened out, this new Funtainer promises to be a great retooling of an old favorite. If you're not reading Mom Advice, you're probably missing out on some great ideas. I don't know how Amy does it all, but her frugal living site has a great breadth of coverage. I particularly look forward to her Thursday Amy's Notebook posts that highlight lots of great ideas from around the web. Her post on bubble wands from Target's Dollar Spot and link to a DIY bubble solution recipe inspired a lot of fun here. After a trip to Target's Dollar Spot for some giant bubble wands and glycerin ($2.69 for 4 ounces; they hold it behind the pharmacy counter at our Target so you have to ask for it; CVS puts it with the scar treatment ointments), we mixed up a gallon of Sparkle Power's homemade bubbles in an empty milk jug (tip to avoid a frothy mess while filling: first fill the jug with warm water; then add the dish soap and glycerin; roll or shake sealed jug gently to mix. Label the jug lest your family mistake the substance for beverages). For our playgroup at the local spray park, Ranger and I loaded the car with two Target bubble wands ($1/each), a gallon of bubble mix, and a third giant SuperBubble wand from Toys R Us ($3, and don't bother- it's awful). 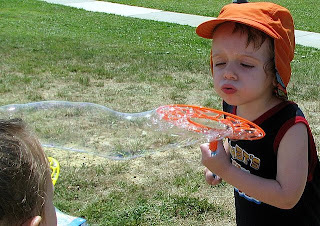 The bubble wands were so easy to use that the toddlers (2 & 3 year olds) spent as much time playing with the bubbles as running through the water sprayers. The glycerin makes the bubbles rather easy to produce and resilient. The wands have many openings, so they produce many bubbles with one swipe of the arm. We found that the yellow flower wand tended to produce a single giant cluster bubble, while the orange wand with the hearts and star border made lots of small to mid-sized individual bubbles. The bubble solution has easily won the admiration of playgroup families and Ranger's grandparents. I can't wait to try it with our Klutz Giant Bubble Maker. It might inspire us to make Mentor Mom's DIY mega bubble wand. Thanks, Amy, for the great recommendations! We were privileged this week to have favorite visitors in town. One of our favorite couples and their four fabulous offspring (ages 1 through 8) took a day out of their vacation to play with Ranger and I. We started the 90 degree day at the zoo and worked up a big hunger for a late lunch at a great tavern/pizzeria. As delicious pizza takes time, we settled in with the 5 kids (ages 1, 3, 4, 6, & 8) for a bit of a wait. Although I wasn't sure that coloring would over well with the older boys, they immediately felt at home with the crayons presented in a green camouflage Doodlebugz Crayola Crayon Keeper. The young artists worked on their masterpieces while snacking on a basket of crackers and lemonades. There's nothing better than a great meal with good friends. One of my young friends gave me a signed copy of his beautifully rendered Aquarium art. I offered him the Doodlebugz as a token of appreciation (you should have seen his smile!). The Doodlebugz Keeper ($14) is a well-made carrier by Princess Linens. It folds into a compact roll with Velcro closure and a sturdy ribbon handle. They come with a box of 24 washable Crayola crayons. Wisely, there are more than 24 slots so those extra crayons lurking in my car finally found found a proper home. Princess Linens is offering Baby Toolkit readers a 15% discount on orders (enter the coupon code babytoolkit at check-out) . We'll also be reviewing their First Scrubs this month. When I was growing up, I loved the nights when our family went to see the Evansville Triplets play. After those magic years of sitting in Dad's employer's box seats behind the dugout, I was sad to see the team leave town and the beautiful historic ball field fall dark on summer nights. My baseball glove (autographed by my favorite player Mark Fidrych) became a permanent resident of the hall closet, and thus ended my brief infatuation with baseball. Twenty plus years later while I was pregnant with Ranger, my dear college friend and her baseball-loving family came to visit. Partially motivated by nostalgia, I planned a night at the Evansville Otters so my friend's husband could visit one of the locations from A League of Their Own. While I spent most of that evening talking with my friend, the mesmerizing effect the game had on her children (and our spouses) was undeniable. The allure of ballpark hot dogs and CrackerJacks were irresistible, and, like the ticket prices, everything was pretty reasonably priced. The boys were most delighted to get on the field and run the bases after the game. Almost three years after our friends' visit, we regularly head to the ball park on hot summer nights to cheer for the local team and soak up the Norman Rockwell ambiance. Ranger has loved baseball since his first visit, so much that Jim is actually learning the rules of the game after 30+ years of sheer indifference. Ranger loves watching the action on the field and reading numbers off the scoreboard to us. I can't say that I watch that much baseball at the games; I'm more of a people watcher, so the crowds have more allure. Between innings local businesses sponsor strange audience participation games (inflatable sumo wrestling and hula hoop tosses), so there's plenty to see even if you don't watch one minute of the actual game. Ranger's grandparents often join us at games. My parents both have a love for sports that entirely skipped my brother and I, so I know they find in kinship in the next generation's sports enthusiasm. So, even if you don't like baseball, it may be worth looking into affordable sports tickets in your area. It's funny how kids can help you appreciate something you've unknowingly been missing. Our friends are coming back to town next week, and we're planning another night with the Otters. They'll get to see our favorite new inning switch game ("Pluck the Polyp," a tong and bucket game sponsored by a local colo-rectal practice). This time an almost 3-year-old Ranger will get to the run the bases for the first time ever. I suspect it will be worth every minute of those 7 long innings to see the smile on his face. Ranger outgrew his convertible car seat pretty quickly. 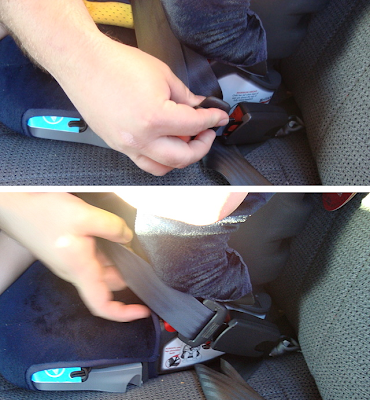 Though we prefer 5 point harnesses for him during the toddler years, we bought a Britax booster seat for Jim's car. Ranger tends to ride in my car most of the time, and Jim needs a car seat that can fit in the trunk during carpool weeks. We've been frustrated on a couple occasions to find Ranger releasing the seat belt while in transit. Toddlers simply don't seem equipped for the responsibility of booster seats. Jim discovered that with our car and our seat (this may not be true for all car and booster combinations) that twisting the seat belt receptacle, he can prevent Ranger from reaching the release button. If you choose to attempt this, please inspect your seat and belt configuration to be sure that pressure won't inadvertently be placed on the release button when the seat belt is tightened. Jim flips the belt receiver before buckling in Ranger and pulling the belt taut. It actually works well enough in our car that the other adults in the family take a little longer to get to the release button. Meanwhile, Ranger likes to direct the activity, "Press the button, Grandma!"